Since moving to this house, I have been plagued with an overabundance of day lilies – the bright orange ones you often see in mid-summer along the roadsides and in neglected areas. They are pretty in their way, but should never be allowed anywhere near a flower or vegetable bed, because they are wickedly invasive. I’m sure I have pulled out at least a million, and have hardly made a dent in them. And they keep finding new places to grow. 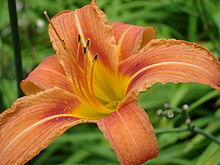 Their botanical name is hemerocallis fulva. They have several common names, but I just know them as ditch lilies. I don’t have a picture of them that I can find, but here is a picture from Wikipedia of what they look like. I have always known they were edible, but only eaten the flowers before, and had little interest in any other part. However, my attitude to invasive weeds is changing, and my curiosity got the better of me as I tried to liberate our maple trees from the small shoots growing around them. Maybe I was hungry at the time, but these neat little shoots looked tasty. I dug some up, along with a few of the tubers attached to them. 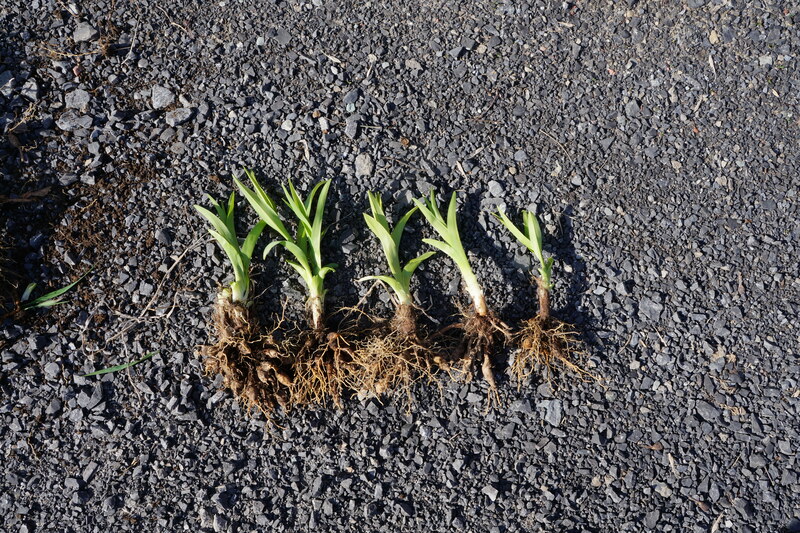 As long as they are 6 inches tall or less, the shoots are tender and not fibrous. 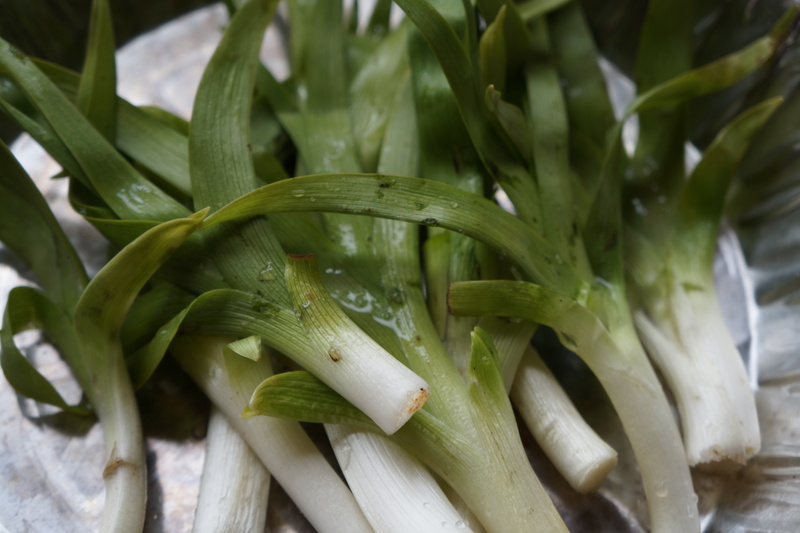 The flavour is sweeter than leeks or onions, and can be used in much the same way. 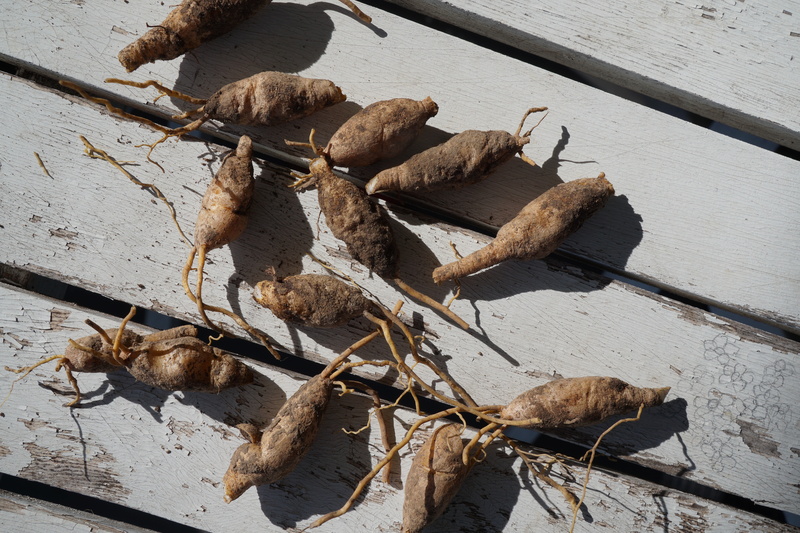 I also collected a few of the tubers which I found taste like water chestnuts. 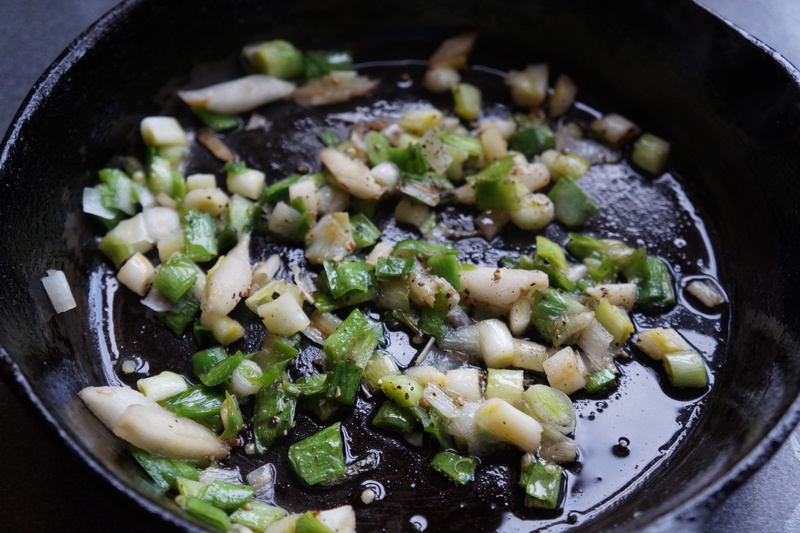 Because I wanted to check out the taste, I added no other flavours – just sauted the shoots and tubers in a little olive oil and added salt and pepper. I used only a few (about 10 shoots and 6 tubers, peeled) because since this was my first time eating them, I wanted to be sure no one in the household had any reaction. I’m happy to report that no one has! 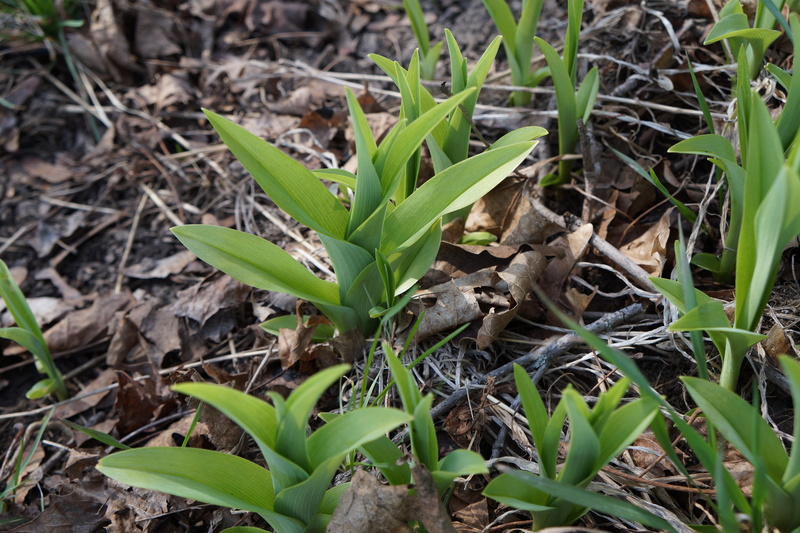 A word of caution: Although these shoots are pretty easy to identify, especially if you know where they grow, be absolutely sure you know what you are picking. Taste a small amount at first to be sure you don’t have a reaction to them. I have read different statistics – anywhere between 2 and 10 per cent of the population will get a stomach upset from them. I also read some allusion to large quantities having hallucinogenic effects, but nowhere did it specify what constitutes large quantities. My advice would be to err on the side of moderation at first, and increase the amount slowly, and never eat too much of anything anyway – no matter how good it tastes. Now that I have sampled them, I can say they are delicious, easy to prepare, and have no ill effects on my physical or mental state. They are a welcome, fresh local vegetable at a time when these are hard to come by. I look forward to coming up with some new day lily recipes, and to being less distressed by their presence in my gardens. 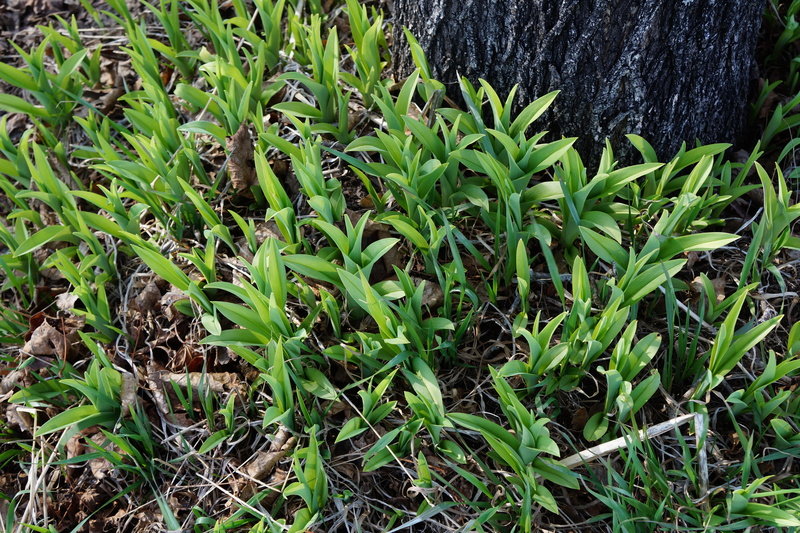 Categories: edible weeds | Tags: day lilies, edible weeds, foraging, lily shutes, lily tubers, seasonal, vegetable dish, wild edibles | Permalink. This recipe has two parts to it – the dandelion part and the noodles. The dandelion ‘soup’ can be served on its own, or with anything else you like, and of course the noodles are soba noodles, so you probably know how you like them. I’ll start with the dandelion part. I weeded two patches of garden and found some dandy looking ‘lions. This is the best time of the year to eat the greens, before the flowers appear, as this is when they are at their sweetest. The roots also looked thick, crisp and white on the inside. I have made tea and ersatz coffee with them before, but wanted to do something else, so I thought of combining them in a soup. The roots are a little bitter when raw, but lose most of that bitterness when cooked. I decided to offset the slight bitterness of the greens with something sweet, which made me think of adding something sour, which in turn suggested hot and spicy. With the saltiness of the soya sauce, I think I covered every taste we have. For more on identifying dandelions and their spectacular nutritional value, check out this site. 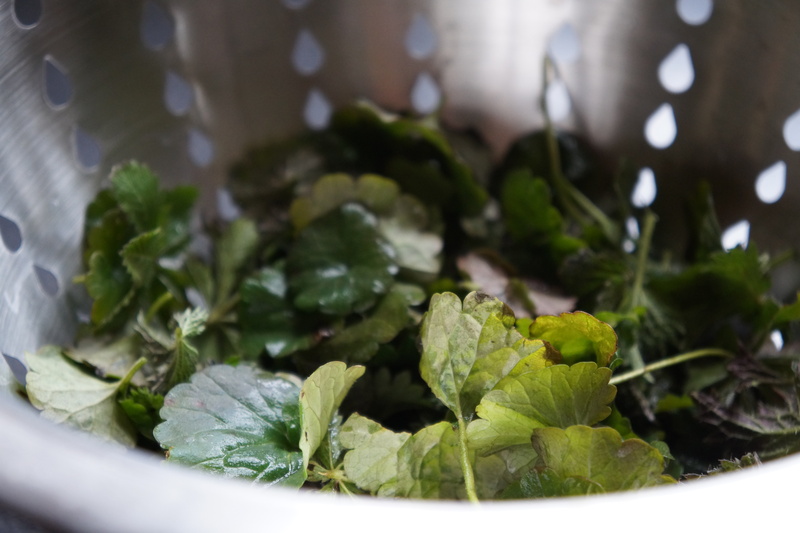 To make the soup, you will have to clean the leaves several times to make sure they are really clean. I don’t bother cleaning the roots too much, as I peel and then rinse them. Of course, you can use a mixture of other greens too. Because it is a soup, quantities can vary, as can the ingredients. I used mushrooms, green onions and flavourings, such as chili, garlic and ginger. Pretty simple really. Mix all these ingredients in a saucepan, heat and simmer until the dandelion roots and ginger are well cooked. Just before serving, add a big handful of dandelion greens and cook for another couple of minutes. Such a soup suggested to me soba noodles – but I didn’t have any – so had to make some. 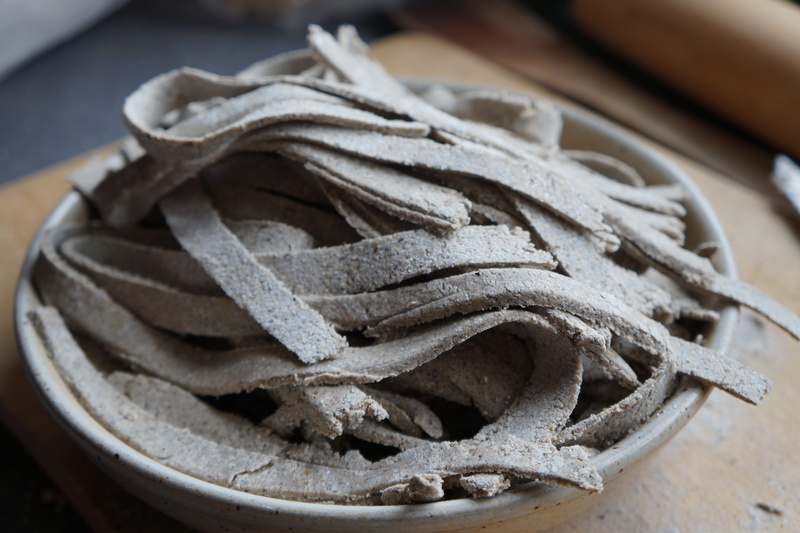 I started making soba noodles long ago, in a far-away country where I couldn’t buy them. I decided just to mix buckwheat flour with water, roll and cut it like any other pasta, and that was it. The best soba noodles I had ever had. Now I have the luxury of being able to consult the internet, and it seems it is harder to do right after all. But maybe that’s not the internet’s fault. I think my buckwheat is the wrong kind. Yes, not all buckwheat is made equal, and I believe mine is of a course nature. If you have the choice and want to make your own, I would buy a very fine flour in an Asian shop. The type you want is called sobakoh. But if you are like me, have no choice, but still want to make your own, just use whatever buckwheat you have. They will still be good, they will just break more easily. Another solution is to mix 3 parts buckwheat with 1 part wheat flour. I might do that next time just to compare. I did do two things I never tried before. One was to use a food processor to mix the dough because now I have one. The other was to add boiling water to the flour – a process I can’t justify but it seemed to work quite well. Add the boiling water slowly to the flour while processing until the dough forms into a ball. You can also do this by hand, in which case you should mix it in a bowl and kneed once you are able to form a ball. Divide the ball in two and roll each piece on a floury board into a rectangle. No need to make it super thin, – it will probably start breaking if you get it too thin. In my first attempt I cut the strands by hand, which is quite easy to do, but mine did not look very neat. For my second batch I used my pasta maker. I got more breakage, but it looked neater. Put the pasta into a big pan of boiling water – give it lots of room so it doesn’t stick together – and boil for 1 minute. Strain through a sieve, and run it under cold water, shaking the sieve to prevent the strands from sticking. To serve, spoon some noodles into a dish. Ladle out the soup on top and garnish with something green. I used green onions. 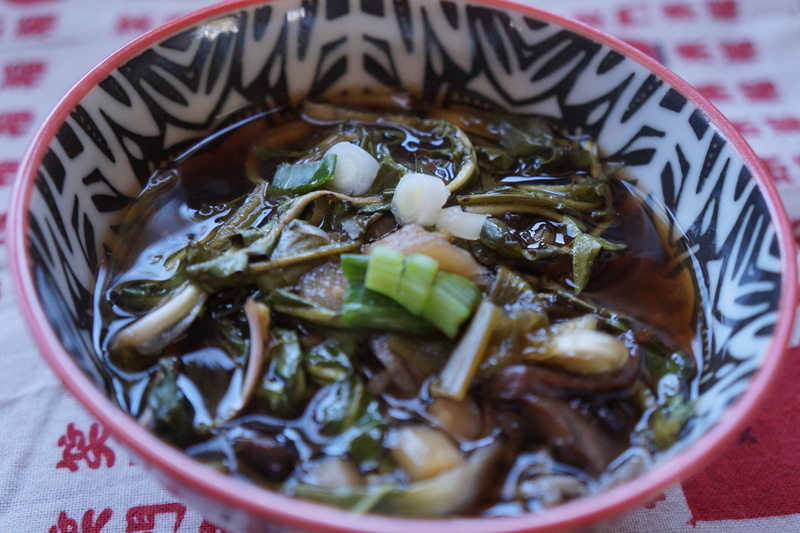 So anyone at Angie’s Fiesta Friday #13 up for trying a sweet and sour soup made with entire dandelion plants and some slightly fractured soba noodles, I hope you enjoy this thoroughly original, tried and tested only by me recipe. 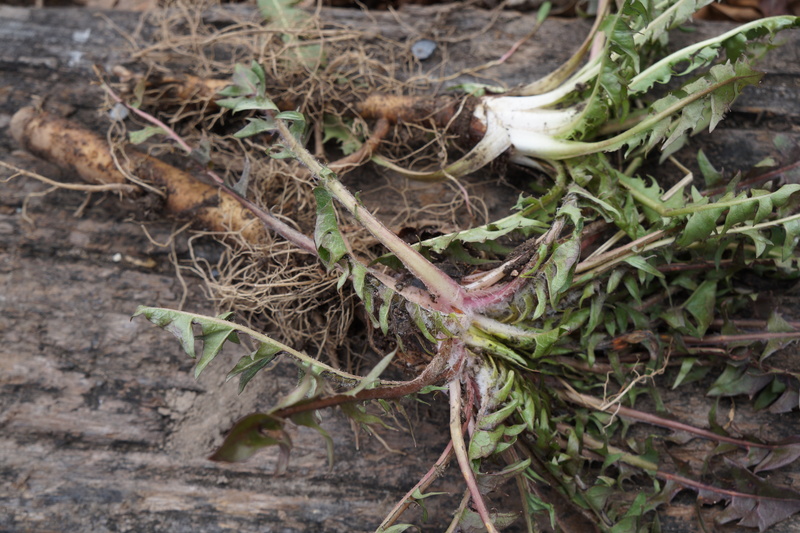 Categories: edible weeds, soup | Tags: buckwheat flour, dandelion greens, dandelion roots, foraging, locavore, sobakoh, spicy, sweet and sour soup, weeds | Permalink. Pasta is a great dish when you want to be creative, or even when you don’t have much in the pantry. With a few pickings from our garden, lawn and fields, I decided to make a vegan, gluten-free pasta dish using Jerusalem artichokes, wild strawberry leaves and chives. I was pleased with the effect of the artichokes and lemon juice in creating a creamy white sauce with no dairy products. As for the greens, you could use any of your edible wilds or not so wilds, but I wanted to try the wild strawberry. I learned that all parts of wild or cultivated strawberries are edible, and since our wild plants are plentiful and don’t give much fruit, why not use the greens instead. For more information about identifying, using and finding resources, check out this site. If you do decide to use strawberry leaves, there are a couple of points worth mentioning. First, as always, be sure you have identified the greens properly. They are pretty easy to spot, but be sure you know what you are picking. The other point is that, while these leaves are most often used in making tea, they should be eaten only when dried, or very fresh. Once the wilting process has begun, they enter a stage of non-edibility until they are perfectly dried. So that is something to bear in mind if using them. Most articles I read said that they are edible, but not really tasty. I beg to differ. They are mild, with a pleasant citrusy after taste. Not remarkable, but certainly nutritious, especially rich in vitamin C. If not sure, sample a leaf or two. This is always a good idea anyway to make sure you don’t have any problem if it is new to you, and you can decide if you want to add them to your dinner. Puree all the ingredients in a food processor. Heat the sauce gently, without boiling. Add some chopped chives and strawberry leaves, and then mix in half a pound of cooked, hot pasta (I used quinoa spaghetti). The flavour of the artichokes worked very well as a cheese substitute, but feel free to add cheese, or anything else, to suit your own taste. Categories: edible weeds, garden vegetable, jerusalem artichoke, main dish, recipes, wild fruit | Tags: almonds, backyard foraging, chives, garlic, gluten free, jerusalem artichokes, lemon, local, pasta, quinoa spaghetti, seasonal, vegan, wild strawberry leaves | Permalink. The best part of foraging is that you can harvest without ever planting a thing, and harvest before you have even had a chance to plant. My seeds for my vegetable garden are just beginning to sprout now inside the house, and it will be some time before any of them are useable, and I face a lot of work before any reach maturity. Meanwhile, wild greens are quickly making their appearance, and I don’t have to walk more than a few feet from my back door to find something tasty, or at least nutritious and green. That’s a good thing, considering it’s snowing outside as I write this, and the ground is just plain muddy. Luckily I picked a few leaves yesterday to add to a vegetarian curry of sorts. I am not suggesting you make curry necessarily – just to be aware that these harbingers of the growing season are already there for the picking, to be used in soups, salads, stews, baking, or wherever you want them. 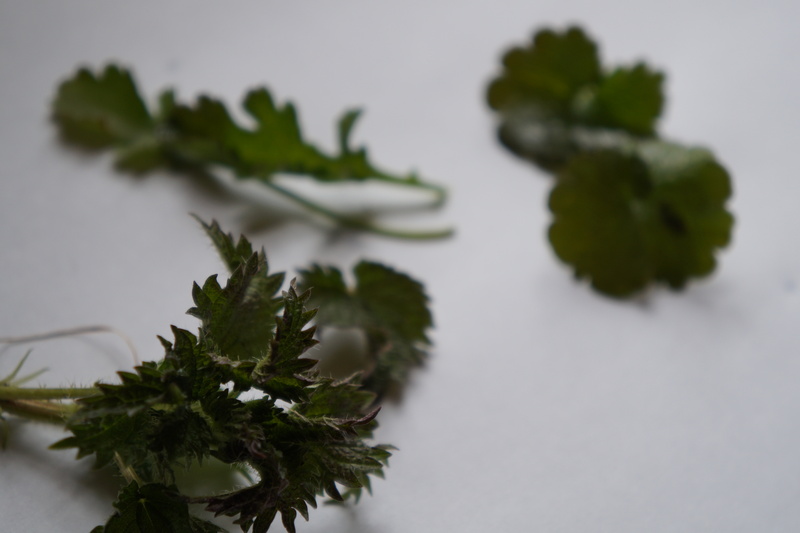 I picked only three varieties for this dish: nettles, creeping charlie or mallow and dandelions. The total amount was about two cups, but enough to green-up my dish. These are all common in this area, relatively easy to identify, and impossible to over harvest. 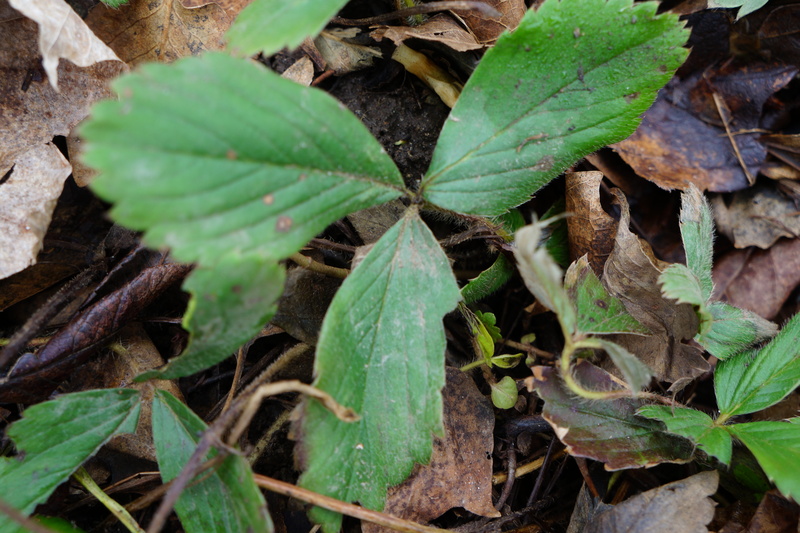 However, it’s still worth remembering two of the basic rules of foraging: always make sure you have identified the plant correctly and be sure to pick only from clean, non-treated areas . Dandelions. These are the easiest to identify and are super abundant in spring. My very first post was on dandelions and the dandelion pesto in it lasted me all winter. 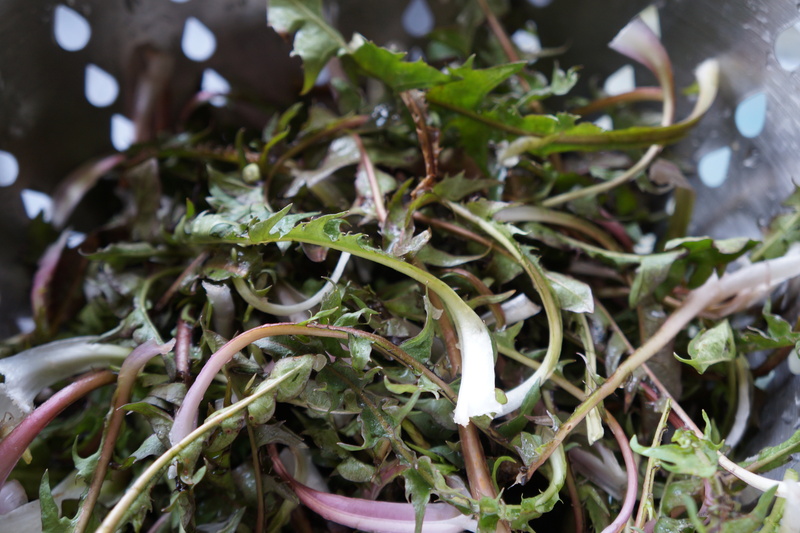 I will no doubt be posting more dandelion recipes this spring, but so far the pickings are slim. The leaves are so young and tender that they do not yet have the strong bitter flavour that I am looking for, but they offer such a load of nutrients, I wanted include them even now. Mallow or Malva. This is another mild flavoured green which I have only recently started to use. You can read more about its identification and uses here. Again, it is more for its nutritional value than flavour that I use it. The roots are edible too, and I hope to figure that part out soon. I have also pickled the seeds in the summer to make something resembling capers. 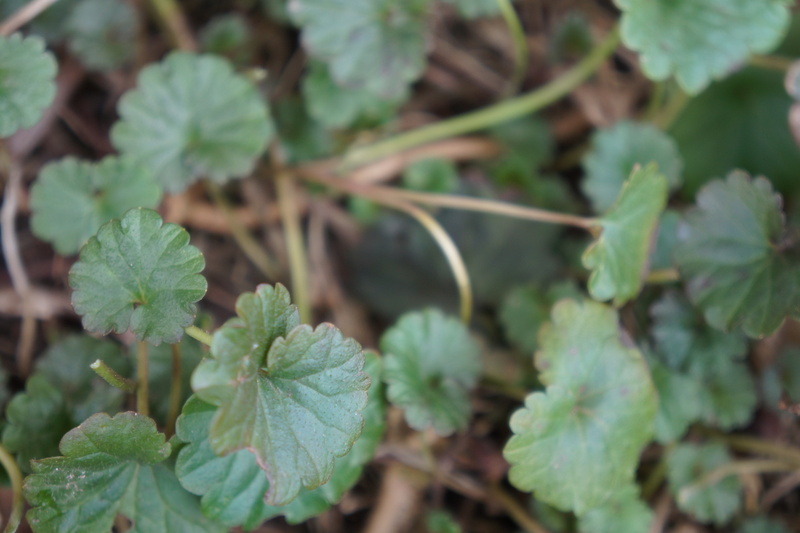 Creeping charlie can be used instead of mallow. They are similar in appearance, easily confused and interchangeable as far as the leaves go. To identify this plant, this site will help. 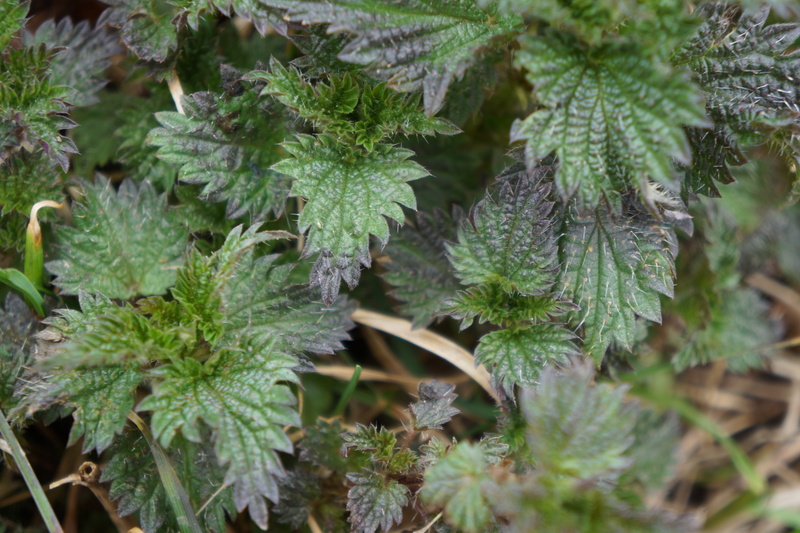 Stinging Nettles. I found two recipes calling for nettles this morning just going through my regular blog mail, including this one for pesto and this one for spring rolls. As long as you are careful to pick these with sturdy gloves to protect you and then immediately dry, grind or blanche them to remove all the sting, these are really very easy to pick. Dried for tea is a popular use for them, but I like them in place of spinach, cooked the same way, quickly and with little water. My nettle patch is just getting started, but it has spread considerably since last year, so I hope to be able to experiment liberally with it. I will also keep chopping at it as there seems to be one school of thought that once it flowers, the leaves become more toxic. Not sure if that is so, but better to be safe. My curry was made with chick peas, onion, a home-made curry mixture, carrots and freshly dug Jerusalem artichokes. I added the greens just before serving, giving them only enough time to wilt. Categories: edible weeds, jerusalem artichoke, main dish | Tags: dandelion, foraging, gluten free, locavore, mallow, nettles, vegan, weeds | Permalink. I usually make stollen for Christmas, and did this past year, but the result was a little ‘cuit’, which in French does not sound so bad, but I thought might be seen as burned by English speakers. So I made another batch, and this one will be for Easter, and to share with everyone at the Novice Gardener’s Fiesta Friday this week. I will also give some my ideas for marzipan alternatives. For my spring stollen, I made a slightly less rich version than the Christmas one by omitting the liquor in which I usually soak the raisins and currants. 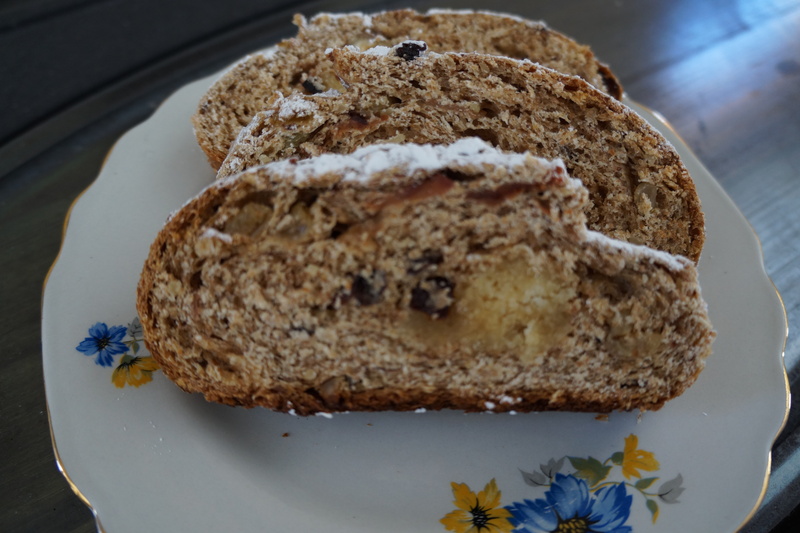 I did not use the usual dried fruits, but used instead some dried crab apples which give this stollen a distinctive and local flavour and colour. I have tried many versions of this recipe, and finally settled on one which has the flavour and texture I wanted. Some are too light and brioche-like, most are too sweet. If there are no ground nuts in the recipe, it is impossible to achieve the density that I wanted. A generous amount of butter is also important. This recipe uses mostly the sweetness of the fruit, but if you want it sweeter, just add more honey. There is no need to be intimidated by making a yeast bread. Just let it rise until lots of air bubbles appear in the dough when you check the interior. In this cool weather, it can take a few hours. I allow it to rise at least three times, and if I am busy, I stir down the first mixture (the sponge without rising inhibitors like fat and salt) until I am ready to use it. I think this extra time maybe improves it, and certainly doesn’t hurt it. As for kneading, I just to it until I don’t feel like doing it any more. As long as it is holding together, it works. Also, amounts of flour vary depending on the type of flour, the size of eggs, etc. Just keep adding flour when you knead it until it is not sticky and not able to absorb any more. Therefore note that the second addition of flour in this recipe is approximate. Just add a little at a time until it feels right. 1. Dissolve the honey and yeast, and allow to sit about 10 minutes, or until the yeast is all bubbly. 2. Pour the liquid over the dried fruit and allow to stand at least 1/2 hour. If you can do this earlier, even the day before, that is even better, especially if you are using liquor. 3. Add the flour to the yeast mixture and stir well. Let sit until it becomes bubbly. This is the sponge method, and at this point you can just stir it down. let rise and repeat until you are ready for the next stage. 4 cups of flour (approximately). I used red fife, which, along with the unblanched almonds, gives it a darkish colour. 4. Mix all the ingredients one by one into the sponge, ending with the flour which should be added about 1 cup at a time. When all the liquid is absorbed, turn it out onto a floured surface and continue adding flour while kneading until it is no longer sticky. Continue to knead for a few more minutes, until the dough is nice and elastic. 5. Grease the ball of dough with a little oil, place in a bowl in a warm place and cover with a tea towel. The warmer the place, the faster it will rise. This stage can take from one hour to several hours. It will not quite double, because of the weight of the fruit and nuts, but it will be very spongy when you check the interior. 6. Punch it down and knead a few more times, making sure to get rid of all the air bubbles. If you want a plain loaf, shape it into 2 loaves and place on a parchment lined cookie sheet an cover with a towel to rise again. This stage will be much faster, will not double but reach about 50% again of its original size. If you want a traditional stollen, divide the dough in two and roll each into a rectangle of about 12 inches x 6 inches. Place a strip of marzipan down the middle, fold one side over the marzipan and then the other side over that. Seal the edges so it doesn’t open when baked. 7. When the loaves plumpen up, place them in a 325 degrees F oven for 1 hour, or until the entire loaf is golden and sounds hollow when tapped. 8. Brush a little butter on the hot loaves. Allow to cool and then sprinkle some powdered sugar on top if you want. 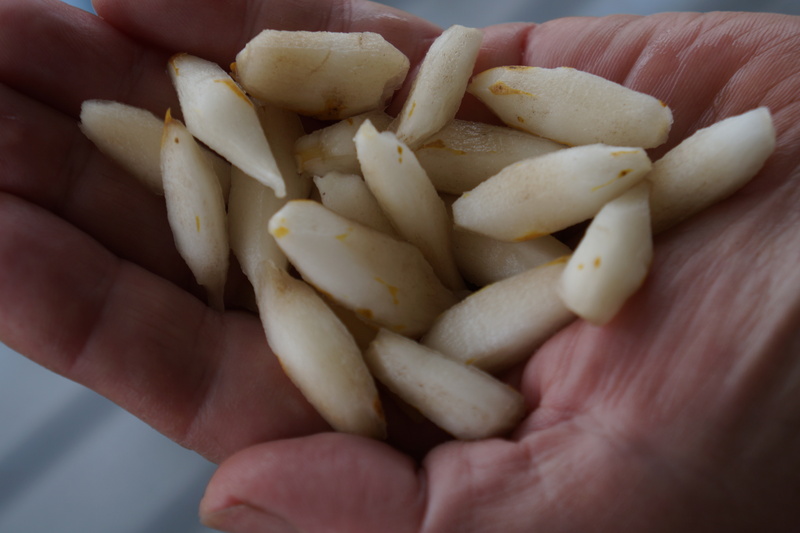 To make marzipan, mix some blanched almonds in the food processor until they start to become a paste. Add enough honey to hold the paste together when processed a few seconds longer and a few drops of almond essence. Form into a ball and cover until ready to use. Or use the maple walnut marzipan recipe from my previous post. When I posted the recipe for walnut marzipan, some readers pointed out they cannot eat nuts, so I also tried a seed and maple syrup paste. I chose hemp hearts because of their superior nutritional qualities and nutty flavour. Apart from the strange green colour, I consider it a real success, and will use it for my future stollens, be they for Christmas, Easter, cuit or not. However, I since discovered that hemp hearts are difficult to find in the U.S., so for those who can’t eat nuts and live in the U.S., I will continue to experiment with other seeds such as sunflower and pumpkin. This is the only part of the recipe that is nutless since the stollen is full of nuts. But I thought it was a good opportunity to introduce the idea of nutless marzipan. For a nut-free marzipan, here is my hemp hearts and maple syrup mixture. 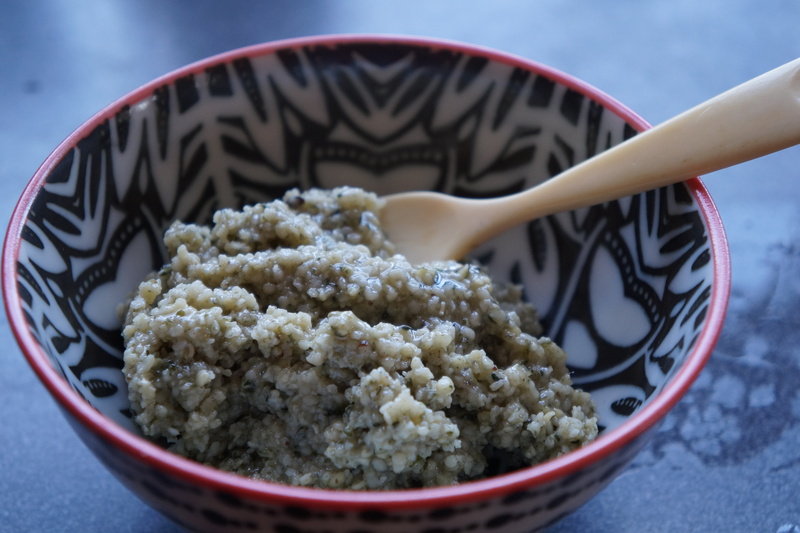 Just blend maple syrup with the hemp hearts in a food processor until it is the right consistency. This same mixture can be thinned a little by adding more maple syrup to be used as an icing or cake filling. I covered an unsugared stollen with it. I like the idea of making an icing without using any refined sugar. Categories: baking, recipes, sweets, wild fruit | Tags: bread, Christmas, crab apple, Easter, Fiesta Friday, frosting, fruit, hemp hearts, icing, maple syrup, marzipan, nuts, stollen, walnuts | Permalink. This week I have the honour of co-hosting the Novice Gardener’s 10th Fiesta Friday along with Julianna of Foodie On Board. This means that I will be an official rep of the party and will mingle with all the guests. For those of you who are not familiar with this weekly event, it is an opportunity for bloggers to come together at a virtual party and bring their recipes, crafts or fun ideas to share with each other. In the ten weeks since it began, I have made new friends in the blogging world, discovered some great ideas and recipes, and just generally enjoyed the up-beat atmosphere of this get-together. For those of you who are blogging and have not yet participated, you are cordially invited to join in the fun. Besides meeting a dynamic group of bloggers, you will benefit from a considerable increase in exposure and number of views, something every blogger can appreciate. The guidelines here will explain how easy it is to participate. My thanks to Angie, The Novice Gardener, for her inimitable hospitality. Pay her a visit and you’ll see what I mean. For this Fiesta Friday, I bring recipes with my own home-made, home-grown maple syrup. 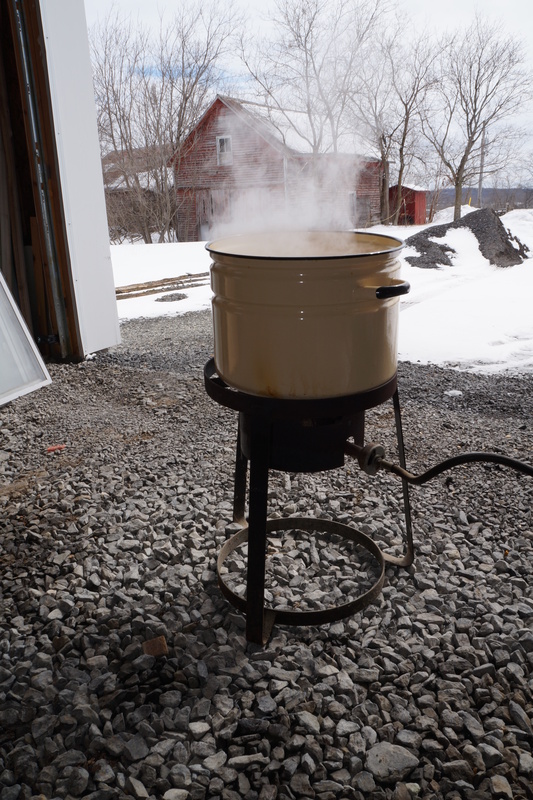 I have just boiled down our fourth batch of maple syrup from our two sugar maple trees in the front garden. Who knew that all this delicious sweetness was there just for the taking? Each batch takes about two hours of cooking on our propane burner outdoors, and another hour or so on a gentle heat indoors to get it to the right heat (219 degrees F. if you have a thermometer). I’m not using a thermometer, and just guessing when it is ready, but so far the batches have been quite consistent. Each batch gets a little darker, and eventually the sap will begin to be coloured when it runs, which means it’s time to stop. That will be a bit of a relief in itself – there will be other things to forage by then. Meanwhile, I have a good supply of syrup to do some experimenting in the kitchen, and this week I came up with a couple of cookie recipes. 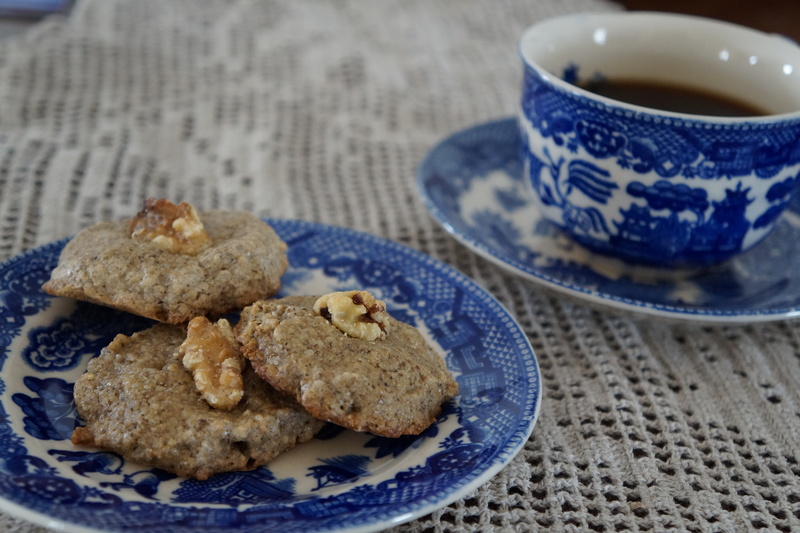 The first was inspired by a recipe for walnut cookies I made last week from Fae’s Twist and Tango’s Naw Ruz roundup. With the extra liquid from the syrup, I had to add some sort of flour, so chose buckwheat because I love the flavour and texture of it when baking. Beat the egg yolks in a bowl. Add the maple syrup, walnuts and flour and stir to combine. Spoon onto a baking sheet, press down flat with the back of a wet spoon and decorate with walnut pieces. Bake at 350 F for about 20 minutes. These are chewy, and not very sweet, although sweet enough that the taste of maple comes through. Then I had four egg whites to use, so I went for a sort of macaron style cookie, which I wanted to sweeten with a maple walnut marzipan filling. 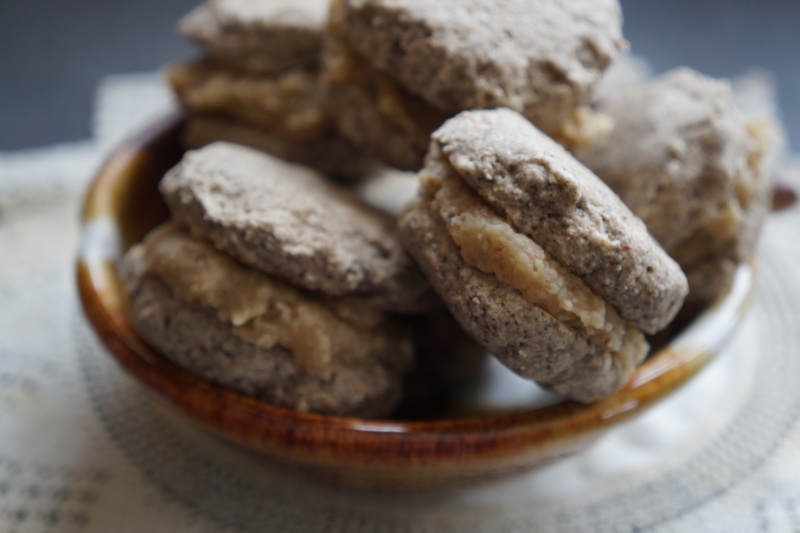 I made the recipe from Buckwheat for your health which was the inspiration for this dish for New Year, and as a macaroon, it turned out beautifully following the recipe to the letter. However this time, with 4 egg whites, I had to do some difficult math. The result was not as elegant as the original recipe, but am posting it anyway, because it was considered a delicious cookie even if it was not exactly as I intended. And you can always follow the original recipe if you want something more resembling a macaron. I was particularly pleased with the filling, and will no doubt find many more ways to incorporate it into desserts and baking. Beat the egg whites until stiff. Combine the flour and sugar. Gently fold in the egg whites. Spoon onto a baking sheet, and flatten with the back of a wet spoon, as this batter does not spread out much. Bake at 300 F for 10 minutes. When cool, sandwich two together with some maple walnut marzipan between them. To make the marzipan, simply grind some walnuts very fine in a food processor, until at least part of them becomes pasty. Add maple syrup while still processing until you reach the consistency of thick honey. How much syrup you add will depend on how sweet and how soft you want it. However you do it, it is delicious. I think even better than fresh home-made marzipan. Categories: baking, recipes | Tags: Fiesta Friday, foraging, maple cookies, maple syrup, walnuts | Permalink.